I was at the event when Bill Clinton came to Rutgers at the height of Barack Obama’s election campaign [when I was still a Rutgers student]. I met/shook hands with Barack Obama when he came to FDU. Not to mention I met Nelson Mandela as an elementary school student in Canada when he visited Toronto, Ontario. Rutgers has hosted others that I attended as well including Rachel Maddow and Nicole Wallace. a blurry picture, but whatever. 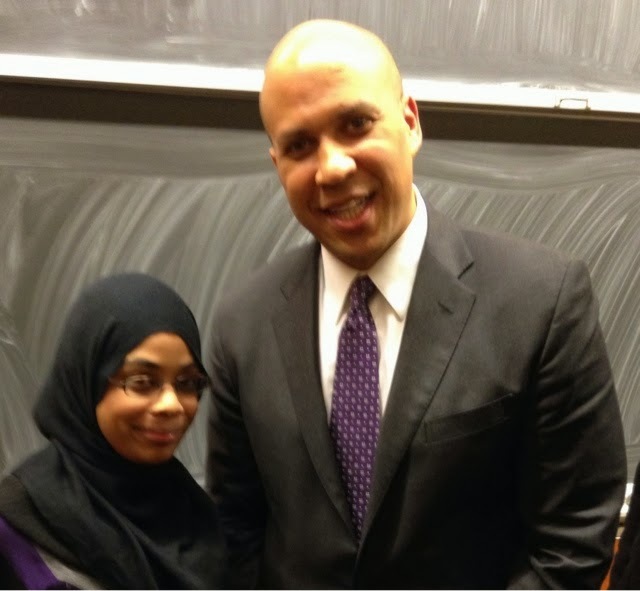 Last night, Rutgers hosted Cory Booker (newly elected to the US Senate). Not only did I get to hear him speak in person [like with the others], but this time there was an added benefit: I got to interact directly with him. An amazing opportunity for someone like me who is so into politics. It started off as a simple tweet expressing my disappointment that questions would supposedly be limited to students from a certain American government class at Rutgers. Booker addressed it on twitter, asked about/for me [by name] right when he walked in to the room and later addressed the question. Which I appreciated very much so. It’s just something else when you get the opportunity to interact with someone in public office that genuinely wants to make a difference in the community. And let me tell you: his personality shines even more in person. If you follow him on Twitter or follow the news, you already have an idea of how “hands-on” involved he is in his community. How many politicians actually do that? Not many. And when they do, they need to be recognized, appreciated, and used as examples as for what the constituents deserve. For all that he has done for Newark, I look forward to him extending that and applying it to New Jersey as a whole. It’s not just Newark he represents now, but like he said himself several times last night: he now “represents the entire state” of New Jersey. Cheesecake and chocolate chip cookies are pretty high on the list of “my favorite desserts”. Here are a few other variations I have done as well: my chocolate chip cookie dough cheesecake and chocolate chip cheesecake. What I did today, instead, was use cookie as the base of the cheesecake [crust], and put chocolate chips in the filling portion along with the little leftover cookie dough batter. Just mix it right in. 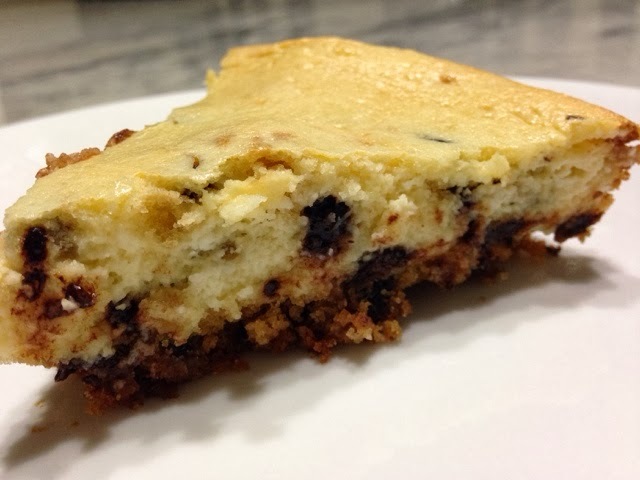 It was pretty much a chocolate chip cookie cheesecake…yum! Your favorite cookie dough recipe or store-bought cookie dough. Preheat your oven to 325 degrees. Spray your springform pan with non-stick cooking spray as an extra precaution. Make your cookie dough using your favorite recipe or use a pre-made dough/log [let it come to room temperature]. Press the chocolate chip cookie dough down into the base of your springform pan. To make the filling, in a large mixing bowl, combine the cream cheese, sugar, eggs, and vanilla extract. Add a cup of milk chocolate chips [and any left over cookie dough batter you have] and mix. Tip: to keep your chocolate chips from sinking to the bottom, toss them with about a teaspoon of flour. Transfer your filling to the spring-form pan on top of the cookie dough base. 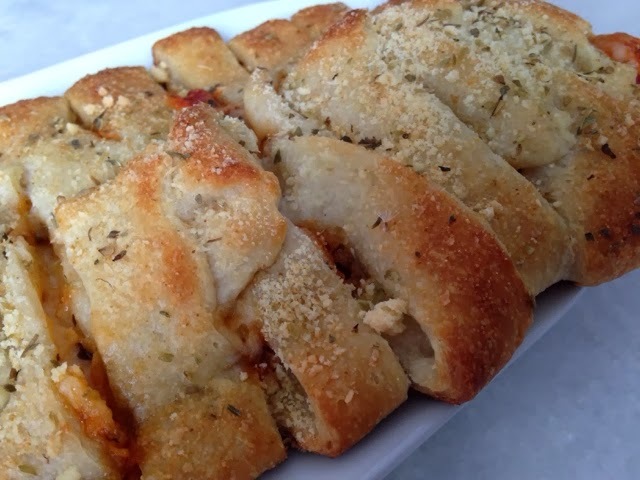 Bake in your preheated oven for about an hour. Optional: for presentation purposes, if I was serving this to guests, I’d melted milk chocolate chips and drizzled that on top of the cheesecake before serving it. Yesterday was a cold and snowy day [the complete opposite of the day before] and I wanted something warm. I had this idea saved in my “must try sometime” pile for a long time, and decided to try it out yesterday. 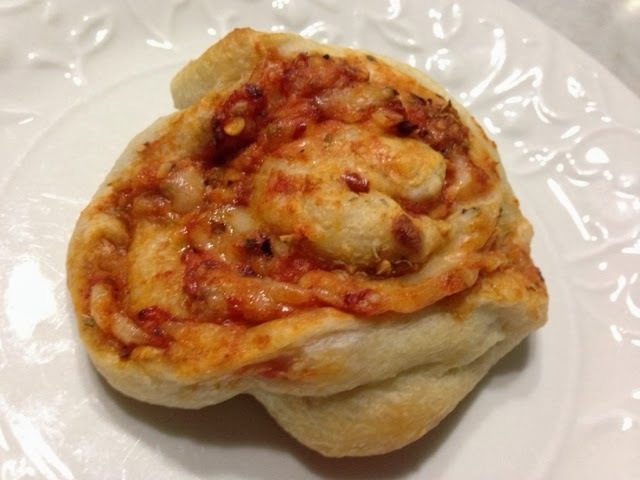 I didn’t want to make a pie dough, and didn’t have a pre-made one on hand… so I used something I almost ALWAYS have in my fridge. Refrigerated biscuits. I use it in so many different ways, yet almost never just bake them as is for simple biscuits. You can find my biscuit recipe by clicking here. Boneless Chicken, cut into tiny pieces. Next time, I’d cut the chicken broth and milk in half because I was left over with some “filling” after 16 biscuits. Starting with the chicken: I seasoned mine with black pepper, garlic powder, paprika, onion powder, cayenne pepper, chili powder, red pepper flakes, thyme, and parsley. Spray your pan [so the chicken doesn’t stick] with non-stick cooking spray. Cook over low heat, until the chicken is cooked through. Meanwhile combineyour chicken broth/stock with milk over low heat. Season with black pepper, garlic powder and paprika. Combine about two tablespoons of cornstarch with a little water [just enough to dissolve the cornstarch]. Add this mixture to your milk/broth mixture and whisk over medium-high speed for a few minutes! This part helps gives that nice creamy milk color and texture we all love so much in chicken pot pie… without the fatness/heaviness of cream, half and half, etc. 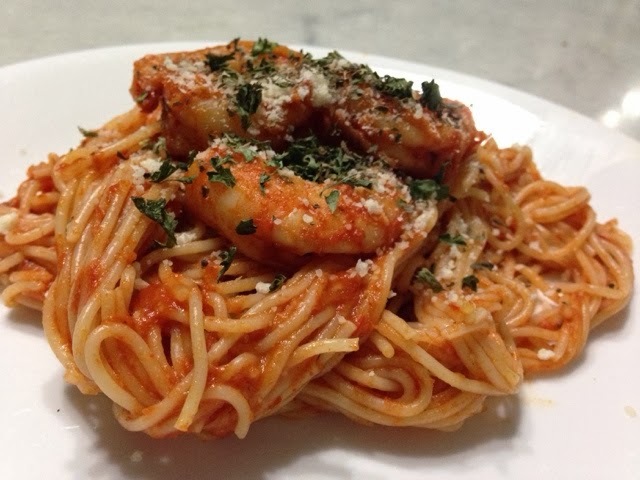 Tip: Make sure you continuously whisk to avoid lumps. Once your sauce/filling has thickened, add in your frozen vegetables [they will soften in the sauce and even more so in the oven] and your cooked chicken. Mix everything together. When I was almost ready to form the mini pot pies, I took the biscuits and rolled them each out so they were thinner and about twice the size they originally were. 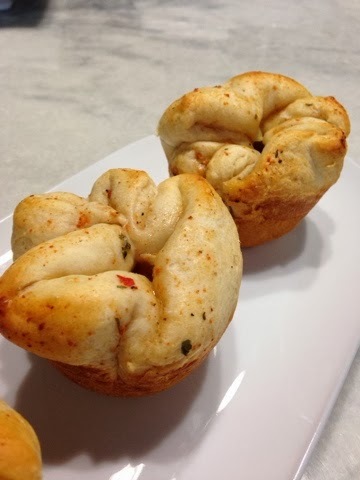 Spray your muffin pan with non-stick cooking spray so they come easily once baked. Line with one of the biscuit dough, pressing it in so it fits nicely and there is enough excess dough on top to “seal” them. Fill the biscuits with your filling, and seal them with your fingers. Bake in a preheated 350 degree oven for about 15 minutes. You can see my Pot Pie recipe from last year’s Pi day by clicking here. On that link, you will also find how I make my chicken broth. I wasn’t planning on making anything for the Super Bowl party my brother’s were having last night… but the night before I just couldn’t help myself and started brainstorming ideas. Since my brother’s were ordering food, I narrowed it downto desserts and finally decided to make a cake. 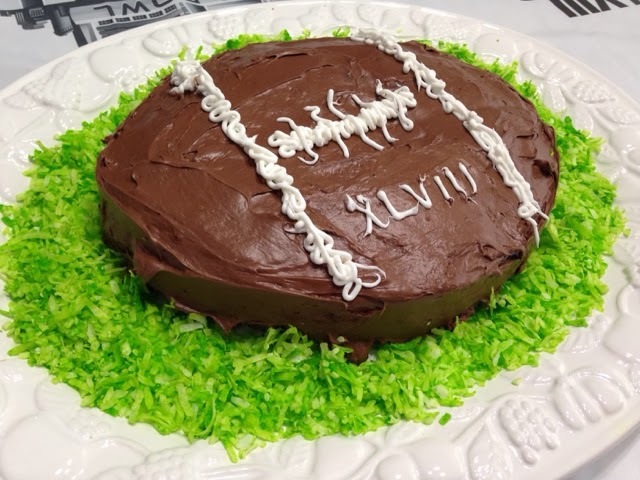 It had to be a football-related cake [it was the Super Bowl afterall] but I didn’t have a football-shaped baking pan. So what I ended up doing yesterday afternoon was: making the football shape on my own using my round spring-form baking pan. I used my homemade vanilla cake recipe and added 1/4th cup of cocoa powder to the batter to make it a chocolate cake. I baked it in a preheated 350 degree oven for about thirty minutes. There was just enough batter left to make five cupcakes that I baked for about 15 minutes. 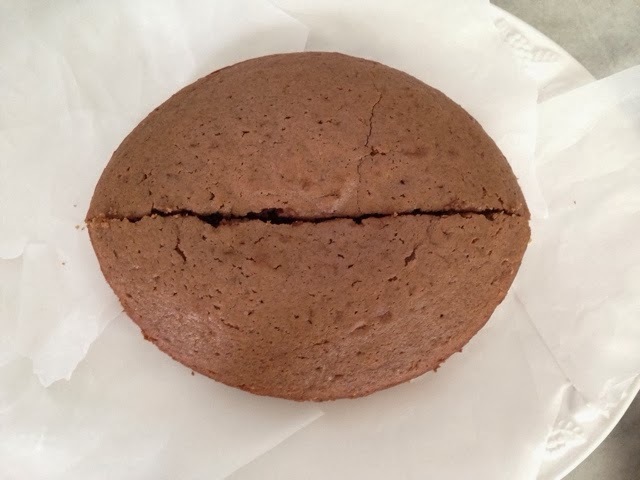 Tip: After letting the cake cool, what I did to make the football shape out a circle cake was: cut a two inch strip of the cake out down the center of the cake [cut less if you are using a smaller pan]. Move the two semi-circles to whatever you will use to serve the cake on. When you connect the two semi-circles, it is now in the shape of a football! I used store-bought milk chocolate frosting to frost my homemade cake. I have vowed to never make homemade frosting until I can get a Kitchen-Aid stand-mixer. Tip: whenever I frost cakes, I line the bottom of the cake with small pieces of parchment paper [easier to remove than one large sheet] so the bottom and edges look clean at the end and avoid a big mess. After frosting it, all that is left is to decorate the top of the cake with the details of a football. Another tip: I took coconut flakes and dyed them green to make “grass” to put around the football cake.